Women's Huntress Wide Leg Rain Boots is rated 4.4 out of 5 by 44. Veuillez consulter notre Politique de confidentialité5link_end% pour obtenir plus d'informations sur la façon dont nous traitons et utilisons vos informations personnelles. La botte Wellington Huntress pour femme est un modèle de conception durable, fabriquée à la main à partir d'un nouveau mélange de caoutchouc souple. Son style féminin se caractérise par une longueur de jambe plus courte et un mollet plus large pour davantage de confort. Avec ses moulures en zigzag, la semelle Argyll est durable et offre une meilleure adhérence sur terrain boueux. Pour les conversions de pointures, la longueur de la semelle intérieure, la région du mollet et la hauteur de jambe, veuillez consulter le guide des tailles ci-dessus. Entretien : utiliser l'éponge brillance Hunter et le vaporisateur lustreur pour bottes en caoutchouc pour garder vos bottes en parfait état. Rated 4 out of 5 by 1234 from Cute and Comfy These are great and best of all easy to get on and off. Rated 2 out of 5 by 8682 from Not a wide leg These boots have a very narrow leg. I can fit into any other boot any company has except for Hunter. I don’t even know why I bothered ordering! Definitely returning. Rated 5 out of 5 by Krobinson from Amazing! Perfect fit! I love these boots! They’re the only rubber boots that fit my larger calves!!! I hope they make these forever! They are so comfortable! I hiked all through Scotland in these!!! Best product ever! Rated 4 out of 5 by Scrawn from Works as it should! Great rainboot. I find the shaft opening is not quite large enough for a wide leg and the ankle area is way too large. 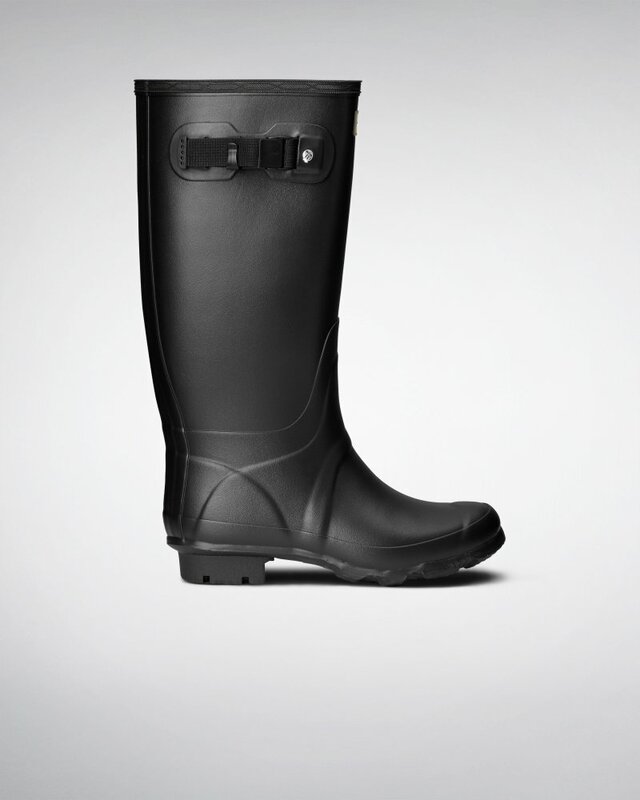 I wouldn't purchase these if you are looking for a stylish rainboot. These are definitely designed to be functional. They are perfect for what I need them for. Rated 5 out of 5 by Shehla82 from Love these boots!! Bought these over a month ago and they are awesome! The wider calf is definitely more roomy for women with a wider calf but if you have a very wide calf these will not fit I think the circumference is just under 17 inches. Rated 5 out of 5 by Kelmel from All time greatest boot! I love the look, height and calf width of these boots. They are pure perfection. Rated 2 out of 5 by Shari from Too Big!! I bought this product about two weeks ago, and they were outrageously big. I am usually a size 7 and I ordered them in this size based on the size chart. They were huge in the calf, as well as in the foot portion of the shoe. Returned them the same day, and I still have no received my refund or any contact from customer service about if the return was successful.